A player who has their forehand, backhand, smash, lob and drop all working nicely is going to wonder what next? Yes, positive results are being attained but what if the opportunity comes to start entering tournaments and taking on more skilful opponents. The challenge then is to add a greater range of weapons to your armoury. But that doesn’t mean learning totally new techniques; rather it is a case of utilising existing skills in a more creative way and introducing more disguise to shot making in order to catch an opponent flat footed or in positional no-man’s land. Of course the simplest way to create openings for yourself is to move your opponent around the court, not only putting them on the defensive and hopefully offering a weak return that can be quickly dispatched, but adding to the physical workload that should induce both physical and mental fatigue. But good hands and a quick wrist can reap similar dividends but with less effort. Think, for example, about an opponent’s shot that nips over the net, requiring a shot played from waist height or below. They’re going to be expecting a defensive forehand or backhand played to the rear of the court to buy you time. And from the length of your backhand, it seems they’ve got you sussed. But when making contact between racket face and shuttle, what if you pull short and simply brush the shuttle back over the net? Your opponent will be stepping back in anticipation of that deep-court shot only to find the shuttle nestling on their own side of the net. Yes, disguise can be a devastating weapon. Demoralising, too. This same checking action of the racket head can also fool an opponent into moving deep to expect a smash that in reality becomes a softer brush into the front of court. Alternatively, an opponent attempting to read your intentions through your back swing can be fooled by employing either slice (turning the racket face inwards at the last second) or reverse slice (outwards) to leave them flat footed. Striking the shuttle in a flat trajectory, known as the swipe, is another tactic of deception from the front of the court. Developing the creative side of your game involves thinking one or two shots ahead of your opponent rather than simply treating each stroke as a separate entity. Planning ahead means you can play a shot not to win the point immediately but to force your opponent into a reply or sequence that allows you an easy kill. Again, the brush over the net is a good example because an opponent may opt for the safe option of a high, deep return. If you have correctly anticipated this, or your opponent’s shot is poor, a point-winning reply should be yours for the taking. 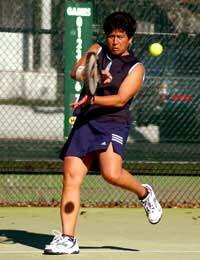 The backhand smash can set up many a winning shot, quite simply because your opponent may not be expecting it. Yes, this is a shot that is difficult to play, but get it right and you’ll create confusion that can be exploited. Developing a greater range of shots in practice sessions is all very well. But when it comes to match play, you’ve got to be brave enough to utilise them. It may well prove the difference between winning and losing.